2-1176, Studio compressor from Universal Audio in the 1176 series.
" 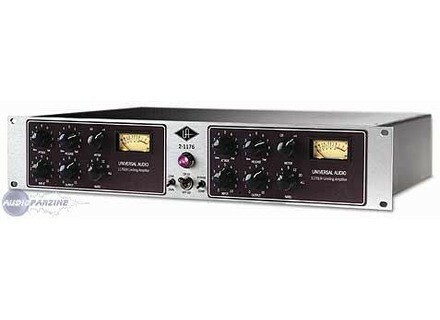 Gand a classic studio"
The Universal Audio 2-1176 is a vintage amplifier with twin limiting in stereo or you can use it in dual mono. It is very expensive as it should be, not because it is vintage but because it is great. Or studio at the University has this amplifier in it and I have been using it for years. In the music world today everything has went digital which is good, but you can never get the sound you will get with a vintage unit like this is. It can be racked and will take up 2 rack spaces on your rig. It has 2 XLR inputs and 2 XLR outputs with a frequency response from 20 Hz to 20 kHz. There are Release, Input, Output, Attack and Ration controls on the face of the 2-1176. This compression on this amplifier is flat out amazing, you will get such a better and warmer tone when using it that you could any digital unit that is on the market today. I highly recommend getting your hands on one of these if you can afford and you will see why it is so expensive. I have found so many different uses for the Universal Audio 2-1176, one of my favorite uses is to run my entire mix through it. Most engineers won’t recommend doing that but I can not help it because the sound that it gives is just so warm and full of life. I have used a tone of different digital mixers that claim they can replicate vintage warmth and none of them can, not even a software plug in can do it. You will not know what you are missing until you get the chance to really use a vintage unit like this one. This 2 channel amp will give you the exact sound of the original 1176 right out of the box. It is worth every dime that it cost.